Smile Communications! ~ CK Jacob: Nigerian Fiction And Lifestyle Blog. We have something that will make you SMILE!! 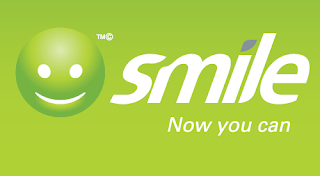 It is with pleasure that we introduce Smile Communications; a NEW telecommunications firm in Nigeria focused on the provision of high-quality, reliable, superfast broadband access using 4G LTE technology. If you long for fast – really fast and reliable– internet, we have the solution! What can Smile do for you? Speed With our state-of-the-art 4G LTE broadband technology, you can now experience download and streaming significantly faster than conventional 3Gnetworks. Depending on your location, uploading and downloading can be upto ten times faster than with 3G. 4G LTE’s superior technology is more responsive, providing a better overall experience when surfing the Web, watching videos or making conference calls. Smile provides you with a reliable connection, which means that it is an‘always on’ connection available for 24 hours of the day. You also get just what you need. Smile has a variety of bundles to suityour requirements, whether you have large amounts of data to move or you’rejust browsing, downloading large files or checking your emails at home or at work. By the way, what is 4G LTE?The term 4G LTE covers two groundbreaking technologies. ‘4G’ means the fourth generation of data technology for mobile networks, while ‘LTE’stands for Long Term Evolution. Together, they make the fastest high-speed data service available today and for many years to come. By joining Smile,you will future-proof yourself. Now Nigerians can start a revolution with a smile! Smile’s DevicesYou can access our high-speed network on a 4G LTE on enabled device, modemor enabled handset that operates in 800MHz band. Smile sells a number ofdevices that offer simple plug and play ways to connect. Noted. I've heard about it.